With the Dodge lineup expanding, including the new Dodge Challenger SRT Demon and the Challenger SRT Hellcat Widebody, who’s to say what will come next? There is talk about the resurrection of the Barracuda, so that could be a possibility. Also, there are rumors about a new coupe to replace the Challenger if it retires. But before the 2017 model year comes to an end, here’s a quick look at everything Dodge has to offer. An iconic muscle car, the Dodge Challenger is one of the most popular Dodge models. A number of trims make up the 2018 lineup, which starts with the SXT (starting MSRP $26,995) and ends with the SRT Hellcat (starting MSRP $64,195). For the 2017 model-year, the Dodge Challenger T/A was brought back from 1970 and there were three variations of it – the T/A, T/A Plus and T/A 392. Known for its mind-melting power, the Dodge Challenger produces 305 horsepower when powered by the standard 3.6-liter Pentastar V6 engine. There are three other engine options, however, including the powerful 707-horsepower SRT Hellcat engine. Available with all kinds of modern technology and adorned with thirteen legacy colors, the design, look and feel of the Dodge Challenger pays homage to its heritage. Often argued as a muscle car due to its non-traditional four-door body, the Dodge Charger is sibling to the Challenger. Like the Challenger, the Charger is available in a number of trims and there are four available engines, including the 3.6L Pentastar V6 engine and the SRT Hellcat engine. Almost an exact clone, aside from the body type and available features. For the 2017 model year, Dodge also reintroduced a throwback trim into the Charger lineup and made two variations of it, the Daytona and the Daytona 392. As the tag “392” states, this vehicle is powered by the legendary 392 cubic-inch 6.4-liter V8 SRT HEMI 485-hp engine. Also available in thirteen legacy colors, the Dodge Charger is just as much a part of Dodge’s history as the Challenger. Loved by parents across the U.S., the Dodge Grand Caravan is one of the best minivans on the market. It has a spacious cabin, open-access sliding doors, and all types of cargo fits in the back. One of the most loved features on the Grand Caravan is the Stow ‘n Go seating system, which has been available on the Grand Caravan since 2004. Plus, the Grand Caravan comes with built-in tailgate seats – just open the trunk and flip the 60/40 split third row seats back for the best seats in the house. In addition to the standard convenient features on all trims, the Grand Caravan is available with many modern technological features to keep passengers busy. A second-row overhead 9-inch video screen, second-row overhead DVD console, and a single DVD entertainment system are all available on various trims, along with wireless headphones to keep the driver from getting distracted. Definitely a family vehicle. Going past muscle cars and minivans, and the Dodge Durango is next on the list. A seven-passenger SUV, the Durango is one of Dodge’s toughest vehicles in the lineup. Whether powered by the popular 3.6-liter 295-horsepower Pentastar V6 engine, capable of towing up to 6,200 pounds, or powered by the 5.7-liter HEMI V8 engine, able to tow up to 7,400 pounds, this SUV is a bit of a beast. A great vehicle for family and friends. Aside from being able to sit seven people comfortably (only 5 passenger seating on the base trim, the Durango SXT) the Durango also offers up to 84.5 cubic-feet of cargo space. It also comes with many seating configuration options, such as a 60/40 fold-and-tumble second-row seat and an available 50/50 split-folding third-row seat. Like the Grand Caravan, the Dodge Durango has many entertainment capabilities such as a rear DVD entertainment center and a rear seat video system. Last on the list, although not as powerful as its counterparts in the lineup, the Dodge Journey still packs plenty of power. It is available with a 283-horsepower engine that has a maximum towing capacity of 2,500 pounds. The Journey also has tons of convenience for seating arrangements and storing cargo. Inside the Dodge Journey are near countless ways to store cargo – in the trunk, rear in-floor compartment, in-floor second row compartments, in-seat storage, and a built-in cooler. If only it had the tailgate seats of the Dodge Grand Caravan. The Dodge Journey is sort of a smorgasbord of all the larger Dodge vehicles. It has the 60/40 split-fold second-row seats, available 50/50 split-fold third row seats, up to 67.6 cubic-feet of cargo space, comes with rear seat entertainment and lots of ways to stay connected, such as an available wi-fi hotspot and Bluetooth. Definitely a SUV for the millennials and generation Z. Like what you see? 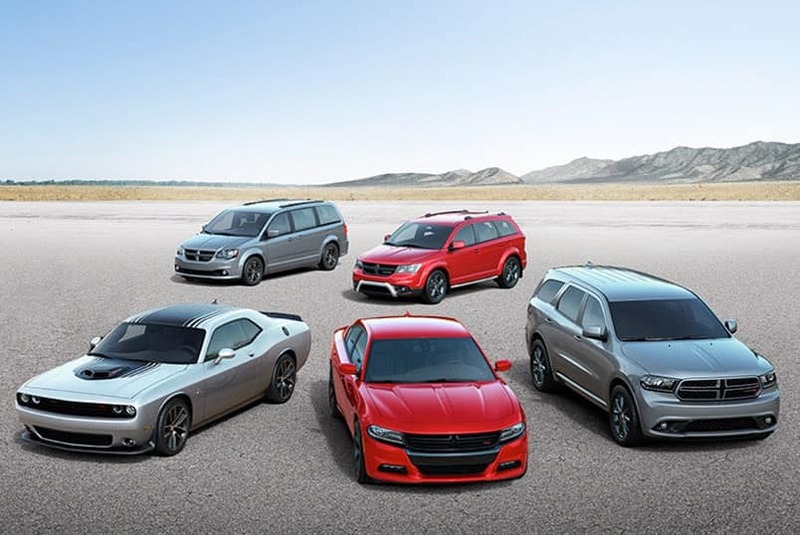 You can find all of these Dodge vehicles in our inventory. Let us know if you have any questions or if a vehicle captures your interest.